Before His Honored Guests Take a Tour of the City. On August 8th, at 1:00 PM, the mayor and all of his paid city employee pet weasels will be hosting a "celebration" for receiving that meaningless FAKE "Livability Award." His guests will include Jocelyn Bogen, U.S. Conference of Mayors; John Wohlrab, Director of Government Relations, Waste Management (Greater Mid Atlantic); Bill Lehman, Business Development Manager, Waste Management (Greater Mid Atlantic); and (selected) Employees from the Departments of Property Maintenance and Public Works who won't snitch if they value their jobs. Jocelyn Bogen obviously has self-interest at heart because she's the one to whom the mayor sent his winning essay, the contact for the Council of Mayors. I'd like to see the photos of East Orange that she and the others on the council took of East Orange before granting the award. What? No photos? Here are plenty, below. John Wohlrab, you remember him, don't you? In 2013 he was awarded an Environmental Quality Award at the annual Clean Communities Awards Dinner, hosted by the Trustees of the New Jersey Clean Communities Council on May 23 in Maritime Parc, Liberty State Park. I guess he won't want to give the game away, either. As for Bill Lehman, I can't find anything about him on-line, but here's what those who work for Mid Atlantic Waste Management are saying about working there. I hope he isn't one of the managers they are talking about. If, so, he's easily paid off. the FAKE "Livability Award". It's Good for Another News Story on a Slow News Day. 06/24/17 EO mayor Gets "Livability Award"
06/25/17 We Get To Live In It. All cities receive guidelines for preparing applications for the City Livability Awards in January of each year. Winners are selected by an independent panel of judges, and the winning mayors are announced at the Annual Conference of Mayors. In other words, a bunch of big-shots in the Conference of Mayors Livability Program read the little blurb shown above, and BASED ON THAT, with NO visits to the city to see if it was true, with NO talking to residents of East Orange to see if it was true, the mayor got invited to Florida to pick up his shiny award. 06/25/17 For those of us who live here, let's take a little Sunday Morning stroll to see this "clean, safe, and profitable" city of ours and the "quality of life" being pushed on us by the mayor. I chose this view of littered Evergreen Place because it gives immediate evidence of what we have to live with in East Orange because our elected officials are so corrupt. The primary election was held on June 6th, yet on June 25th the LINE A posters along Evergreen place have not yet been taken down. But look closely just beneath the UP Arrow on the lamp post and you will see the remnants of a sticker from 2001 when Dwight Saunders (currently the code enforcer) ran for mayor and used the same lamp post in violation of city code 238-4. I wonder if that was mentioned to former president Bill Clinton when he came to shake everyone's hand for winning the "Livability Award." He knows quite a bit about corruption himself. But I digress. My trip began heading north on well-littered Cambridge Street. This is not some dumping done by outsiders, as the mayor suggests, but it seems some people enjoy living in a slum they create themselves by their droppings. The Fancy Clock in the Clock Garden is an example of the lack of planning and maintenance by the City. When they bought the fancy clock, did no one think that it might break down or have to be adjusted from time to time? Apparently there is no one in the Public Works Department with a step ladder and the knowledge of how to fix the clock so that all four sides tell the same time. We'll see other examples of this lack of planning and maintenence as we move along on our tour. Oops! It looks like a car had a run-in with a metal street sign post. I wonder how long that has been there, creating a sidewalk hazard, or how long it will be before someone from Public Works notices it and (gasp!) actually repairs it, or at least removes it. I'm sure that will be fixed long before the other sidewalk hazard under the red arrow is noticed or repaired. That seems to have been like that for years. The mayor only says that a "clean city is a safe city" but nothing about physical hazards like this creating an unsafe city when enough of them are neglected. I remember when Evergreen Place used to be the most beautiful and prosperous street in East Orange. Now it is a shambles of vacant and abandoned buildings. From this corner, you can look down Evergreen and see the Ramada Inn Sign, of the one and only remaining hotel in East Orange. Take a look at the way it used to appear before the current mayor took office, and don't forget to read the reviews. On the other side of Harvard Street, we see the remains of the shell of what used to be the Lincoln Motel, that was used to house those made homeless by fires, etc. It was also a center for prostitution, as well as drug dealers and users. It was closed in 2006 and is currently off the market, but here's what it used to look like. This is a 1999 article about the Lincoln Motel's counterpart in Newark, and much of what is written there was also true for the Lincoln Motel in East Orange. I have often noticed that the Essex County and East Orange City-owned and operated buses for Senior Citizen and Disabled Adults use Harvard Street to "hang out" and run their engines, instead of looking for seniors and disabled adults who need rides. Just sayin'. Ted Green and the Line A Council persons are no friends of shade trees, as was shown by the way they nailed and taped their posters to living trees as well as city lamp posts in violation of City Ordinance Code 238-4 beginning in late May, 2017. It seems they are also giving away what their attitude will be towards their elected positions beginning in January 2018 - do nothing, take the taxpayer's money, start planning for the next election. Instead of taking down the posters, they intend to leave them there until they fall off by themselves and add to the litter on the streets and sidewalks, as shown in the photo on the right. Brick Church Station is separated from Brick Church Plaza by this access road, which is always crowded with taxi cabs and always covered with litter, both from the taxi activities as well as whatever the wind blows back here from one of the city's biggest sources of litter, Brick Church Plaza. The train station is also known for its permanent stink of urine, from all those concrete posts being used as P-trees by the male population. At the Halsted Street entrance, we can see the source of much of the pollution, the largest being Shop-Rite. The chain-link fence stops much of the wind-blown litter, but not all. Looking north on Halsted Street towards Martin Luther King Jr. Blvd., we see one of the most continuously littered stretches of sidewalk in East Orange. Trash issues from Brick Church Plaza behind this former Social Security Building, and blows around constantly. This is early Sunday morning, so it is not quite as bad as it gets towards the end of each day. The same view, but looking south on Halsted Street towards the elevated railroad tracks, as I was on my way back home. Not a trash can in sight. Note that the other side of the street, where there are two churches, is relatively clean and kept that way by church members and workers on days when there are church services. But no one cares about this side of the street on a Sunday. Back at the Halsted Street Entrance to the East side of Brick Church Plaza, we can see that for years people have been telling the management of the Plaza (with their feet) that there ought to be a paved path to the street, but apparently the management doesn't care or can't afford paving blocks from all the money they make from those same customers. Nor can they put a trash can here. Nor do they care if businesses with no affiliation to the Plaza nail or tie signs to the stately pine tree at its entrance. Public apathy is part of the problem ignored by mayor Taylor in his fantasy dreams for the city. Inside the Plaza, we see the litter along with a possible solution in the form of those shopping carts. All day long, workers from the two main businesses whose customers use shopping carts are kept going back and forth to collect those carts and return them to the stores. What if those same workers had grabby sticks and used them to pick up litter along the way? No, that's too much like useful work and the workers would actually have to care enough about their city to do a good job. Another solution is to hire high school students and the school drop-outs who hang around the stores looking for customer tips from carrying packages to become litter scavengers for a salary. While Shop-Rite is the major contributor of litter to the area, the other large store, Lot Stop, does its share, as do all of the other smaller stores clustered around them. After awhile, no one even notices the litter. They just accept it as part of the environment, like all those black dots on the sidewalks that go unnoticed by city dwellers - chewing gum spit out of the mouths of gum chewers, stepped on and stuck to shoes and ground into the scene like modern mosaic tiles in search of an artist. Ignoring these problems must be what the mayor means when he talks about "quality of life." On my way back home, I saw more evidence of the mayor's concept of "quality of life". The LINE A poster from the June 6th Primary Election was still attached to the street lamp post, still covering and obscuring the safety directions beneath. Although there were trash and recycle containers set out on the corner, they were being obviously ignored as the trash on the ground shows. Across the street along the side of the Extra Supermarket, a trail of litter from East Orange residents "Dumping on East Orange" because they want to, not because they have to. There are plenty of trash and recycle containers on this corner within easy reach, but the people don't feel that this is their home, their city, or that their "quality of life" depends on their choices. Even my cat knows enough not to crap where it lives, but goes off, digs a hole, does its business, and then covers it up. These people aren't even that smart. Along Central Avenue, in front of the Extra Supermarket, are some city benches for those waiting for buses. Next to the benches the city has enclosed some fenced planter spaces for trees and recently added some flower plants. Note that three of the flowering plants were targeted by bricks, dropped on top of them for the purpose of destroying them. It could be the act of children whose parents or guardians allow them to do such things and who don't take responsibility for the damage they cause. The rest of the litter was tossed there on purpose rather than into the trash or recycle containers a few feet away. That litter came from the stores around here, but where did the bricks come from? Of course! The bricks came from the Public Works Department whose workers, instead of cleaning up the trash and litter, and then instead of making quick repairs to the sidewalk by filling in the damaged space with bricks, simply piled up the bricks with their foolish cone display drawing attention to them and left them there on the street for whomever got the bright idea of dropping them on the ugly flowering plants that were obviously left as a target for the mentally deranged. Quality of Life in East Orange. This fenced in tree planter surrounded by flowering plants is obviously what the Department of Public Works was attempting to provide a few feet further down the street from the other one. Except for the bottles, cans and other litter generously provided by those who wish East Orange to become the slum of their dreams. I'll end the tour with this final photo of evidence about who is "dumping on our city." This location, with its missing street light and sidewalk hazard of scattered bricks, has been reported since 2014, when Lester Taylor began as mayor. It has since been shown every year because it is at the entrance to our local polling place. It is clear that while outsiders may have dumped on our city in the past, none of what I showed in this report came from outsiders. The dumpers are, starting at the top: the mayor, every member of the Line A City Council, every Line A Democrat that voted them into office and still intends to keep them in office, and every resident of East Orange that contributes to the problem and that refuses to look around and see the slum into which their city is sliding. 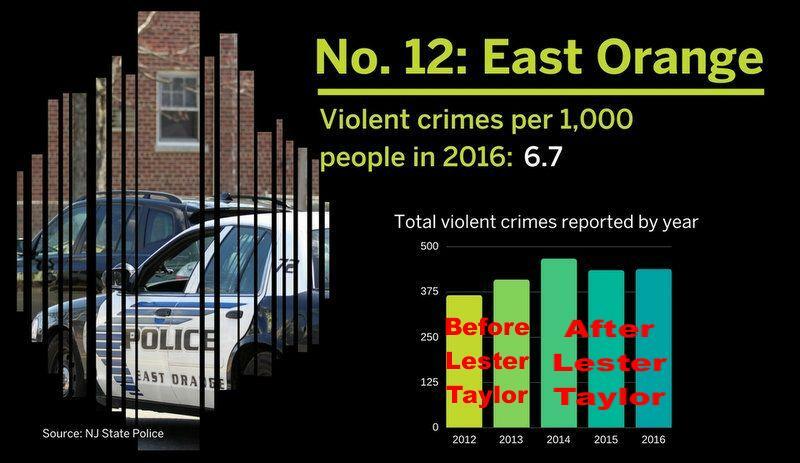 08/01/17 East Orange "Wins" Another FAKE Award! 08/01/17 - News Report from The Alternative Press, which reports any old thing the mayor or city council tells it to. New Jersey Clean Communities is a statewide, comprehensive, litter-abatement program created by the passage of the Clean Communities Act in 1986. The Act provides guidelines on the use of funds awarded. Municipalities and counties must implement litter abatement programs that incorporate the elements of cleanup, enforcement and education. Municipalities and counties must file statistical reports with the New Jersey Clean Communities Council, Inc. every grant year. Statistical reports track the expenditure of funds and the progress of local programs. The problem is, no one ever checks on these statistical reports to find out if the municipality is TELLING THE TRUTH or NOT! Because if they were, one visit to the littered city of East Orange would convince them that the City is LYING and their funds are being wasted. Notice also that this statistical report is NOT put on-line so that we can all see the extent of the lies it contains. But this is what I can put on-line: it's time to take another trip around the city in real time. Once again, we begin our trip on Cambridge Street. That's a smashed up mirror. We're not off to a lucky start. Someone managed to set the clock correctly in the Clock Garden. Now if we can only get the litter picked up from beneath the flower bushes. I guess that is more difficult than fixing a clock. Here's another problem that is too difficult for anyone in Public Works to solve. The bent pole may still be there next Christmas. More litter has been accumulating in the street. I actually like the wild blue cornflowers growing in front of the dilapidated Lincoln Motel. It's all the litter in and around the greenery that spoils the view. I missed taking a photo of the Lincoln Inn Parking Lot when I was here in June. It's a wonderful place for urban youth to play, and the gates are always wide open to welcome them in. Another trouble spot I missed photographing in June - this corner of Evergreen Palce and Freeway Drive East with smashed down fences and lots of litter. I hope Bryant Cowart is feeling proud of his Clean Communities Program Award "for maintaining a comprehensive cleanup, enforcement and education program in the City of East Orange." When is it going to begin? Not much has changed at Brick Church Plaza across the fence from the Train Station, except that new litter has replaced the old. The entrance from Halsted Street to Brick Church Plaza seems to have been cleaned up a bit, but new litter has replaced the old and the tree is still advertising someone's hair bundles for sale. The inside corner of the South East Side of the Plaza seems to continue to collect the litter like a magnet. The litter between Lot Stop and Shop-Rite is on-going, as are the chewing gum black spots on the sidewalk. I decided to revisit the old Line A Democrat Code 238-4 Signpost Violations on the way back, adding some new ones I skipped over in June, never imagining that they would still be here in August. According to the sign on the building, this is being used by the State of New Jersey's Department of Children and Families. The problem is, if you try to locate the place under that name on Google, you get nowhere. Is this a state secret? Two more Sign Post Code Violations, plus a lot of litter in-between. If the East Orange city council and mayor don't bother to obey the laws, why should ordinary citizens? The East Orange Code Enforcer, Dwight Saunders, who ran for mayor in 2001 and never bothered to remove his sticky poster from the above city lamppost in all that time, under the current Code "shall be punished by a fine not less than $100 and not exceeding $2,000 or by imprisonment for a period not exceeding 90 days or by a period of community service not exceeding 90 days, or any combination thereof. Each day any violation of this Code or any other ordinance or rule, regulation or order promulgated pursuant thereto shall continue shall constitute a separate offense unless otherwise provided." If he is exempt from the Codes and fines he is supposed to enforce, then I guess there is no rule of law in East Orange while he remains in office. Who will drain our swamp? The good news is that the bricks have finally been replaced in the sidewalk, and CABID (Central Avenue Business Improvement District) has finally admitted "ownership" of the flowers and removed the bricks that were smashing them down in June. The bad news is that the people of East Orange prefer to live in a slum of their own making and continue to litter the streets and gardens whenever possible, in spite of the proximity to city trash cans and recycle bins. So, New Jersey Clean Communities, no one here really deserves your award, so please come and take it back before it ends up on the street with the rest of the useless trash. Death threats are automatically referred to the F.B.I.